12th – 24th December 2018 – Now Booking! Following a sell-out run last year, Humbug! returns to St Nicholas Priory this December. Expect live music, video projections and plenty of festive cheer! A unique and immersive Christmas experience taking place throughout Exeter’s oldest building. 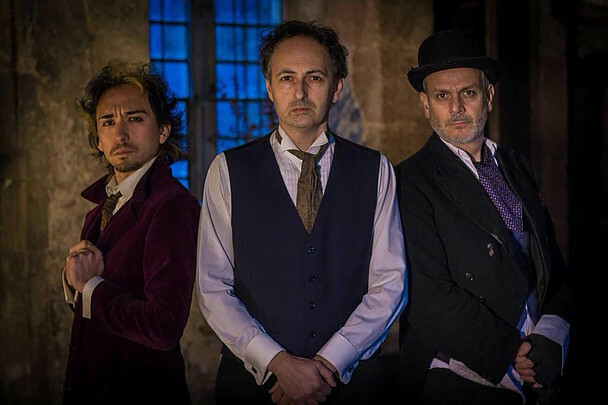 Join Ebenezer Scrooge on a journey through past, present and future in this theatrical reimagining of Charles Dickens’ classic ghost story A Christmas Carol. Featuring original music by Benjamin Akira Tallamy. Our box office opens 30 minutes before the show. We are unable to admit latecomers once a performance has started so please arrive early to avoid disappointment. St Nicholas Priory can get quite cold in winter. Warm layers and coats are highly recommended. The show lasts approximately 70 minutes and there is no interval. Please note: Telephone bookings are subject to a £1.75 booking fee. Humbug! has been designed with younger audience members in mind but aspects of the show may be too frightening for children of a sensitive nature.